FREMONT, Ohio – After a big night of racing Saturday, Aug. 11, the points battles for both the All Pro Aluminum Cylinder Heads FAST 410 Championship Series Presented by Ohio Logistics and JLH General Contractor FAST 305 Championship Series Presented by Engine Pro saw movement in the top 10 as the season starts to wind down. The FAST 410 series has only four more events while the FAST 305 series has just three events remaining. 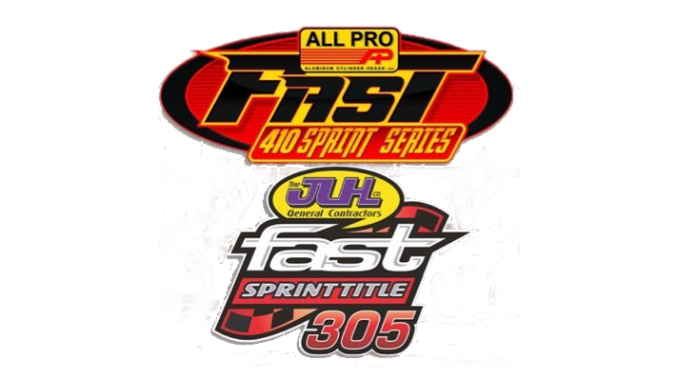 The FAST 410 and 305 sprints will be in competition Friday, Aug. 17 at Attica Raceway Park in Attica, Ohio, the final race for the series there this season. The FAST 410 sprints are scheduled to make their first ever visit to Sharon Speedway in Hartford, Ohio Saturday, Aug. 18. The previous FAST event at Sharon was rained out in May. Both FAST 410 features this weekend will pay the winner $3,000. While Attica has been off the past two weeks for the Attica Fair, Sharon Speedway featured 410 sprint cars Saturday, Aug. 11 and hall-of-fame driver Dale Blaney scored the hometown win. Friday at Attica Raceway Park gates open at 5 p.m. with racing underway at 7:45 p.m. For more information go to www.atticaracewaypark.com. “We’re getting down to the championship push and things are getting very interesting. We are looking forward to taking on the tough Western Pennsylvania teams at Sharon Saturday and our 305 teams will get to experience the tradition of racing during the Sandusky County Fair. There’s still some very entertaining racing coming up for the FAST teams,” said Rich Farmer, FAST Promoter. This past Saturday, Aug. 18, saw Republic, Ohio’s Cap Henry score the $20,000 FAST 410 victory during the Second Annual Great Lakes Dirt Nationals at Mansfield Motor Speedway in Mansfield, Ohio. Henry’s third FAST win of the year moved him to with 175 points of Craig Mintz. Mintz, a two time FAST champion, had mechanical issues at Mansfield and salvaged a 13th place finish. Mintz has four series’ wins in 2018, all at Fremont Speedway. Former FAST 305 champion Stuart Brubaker, who has a series’ victory at Attica Raceway Park, remains second in the points only 106 markers behind Mintz. 2017 Attica Raceway Park champion Chris Andrews is fourth in the FAST points with two series’ wins at Fremont Speedway. Tyler Gunn rounds out the top five in the standings. Sixth through 10th in FAST points are defending series’ champion D.J. Foos; former rookie of the year Jess Stiger; current rookie of the year contender Kelsey Ivy; Duane Zablocki and T.J. Michael. Four time series champion Byron Reed is 11th. In the JLH General Contractor FAST 305 Championship Series Presented by Engine Pro, Fremont, Ohio’s Jamie Miller holds a 127 point lead over John Ivy in the standings. Miller has 10 overall wins in 2018 including six FAST victories. Ivy has a series’ win at Waynesfield Raceway Park. Tyler Street’s first ever sprint car win at Mansfield on Saturday vaulted him into third in the FAST standings, 208 markers behind Miller. Kyle Peters has put together an outstanding campaign in 2018 and sits fourth in the FAST standings while Brandon Moore rounds out the top five. Sixth through 10 are Seth Schneider; 2015 FAST champion Bobby Clark who has a series’ win at Fremont Speedway; Kyle Capodice; Matt Lucius and Paul Weaver, who has won the last two FAST championships and has two series’ wins at Attica Raceway Park. The FAST 305 teams will help open the Sandusky County Fair at Fremont Speedway on Tuesday, Aug. 21 with a special purse in the making. 1. Craig Mintz, 2637 pts. 1. Jamie Miller, 3004 pts. 2. John Ivy – 127 pts. 3. Tyler Street – 208pts. 4. Kyle Peters – 231 pts. 5. Brandon Moore – 235 pts.